I went with a couple of mates. We missed out on tickets when they went on sale and the only way we could get there was to buy tickets for a coach trip from Middlesbrough. So we were up at 4am, drove to Middlesbrough and joined a coach which left at 5am for London. We arrived well before noon, had a couple of drinks and entered the stadium, which was of course completely packed so we found a spot in the stands right at the back. A few minutes later Status Quo took to the stage with “Rockin’ All Over The World” and the day started. This was Quo reunited one year after the split, with Alan flying over from Oz to join Francis and Rick. Their short set also featured Caroline” and “Don’t Waste My Time”. A fitting start to the day. I have so many great memories of that day. Queen’s performance is, of course, often rated as the greatest live performance by any band. 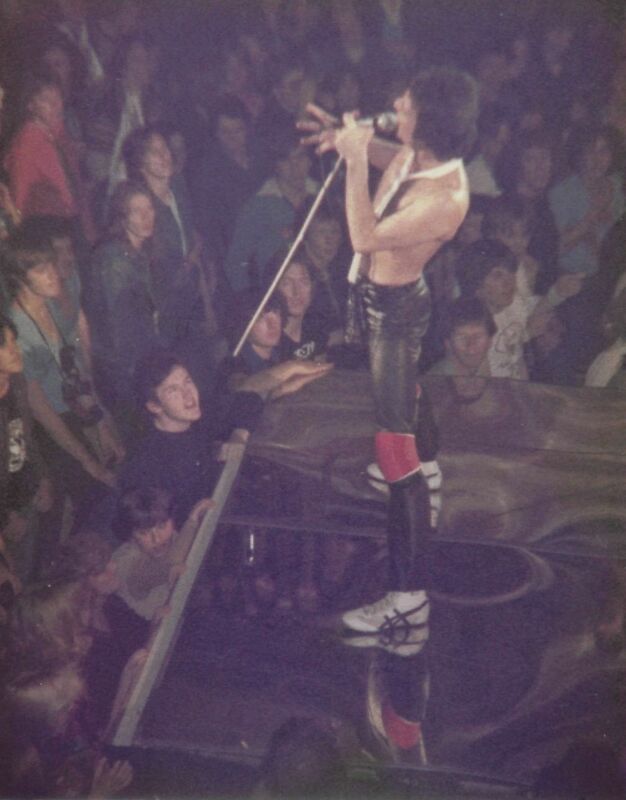 Freddie certainly commanded the crowd the day and it propelled them to super stardom. Their well planned set was a medley with short sections of their anthems: “Bohemian Rhapsody”, “Radio Ga Ga”, “Hammer To Fall”, “Crazy Little Thing Called Love”, “We Will Rock You” and “We Are The Champions”. They had apparently been rehearsing their short set for days, to ensure perfection, and it showed, and worked. U2 weren’t far behind them, though, in terms of performance, with Bono showing how great a front man he was. U2 played two songs: “Sunday Bloody Sunday” and a lengthy version of “Bad” during which Bono dragged a girl from the rush down front to dance with him on stage, and which also included snippets from Lou Reed’s “Satellite of love” and “Walk On The Wild Side”, and The Stones’ “Ruby Tuesday” and “Sympathy for the Devil”. Electric. For me, however. the highlights were The Who and David Bowie, as I was, and remain, a big fan of both acts. Bowie started with “TVC15” (a strange and poor choice I felt, and remember being disappointed on the day), “Rebel Rebel” (great, good choice), “Modern Love” (well, ok) and then “Heroes” (we all sag along and it was pure magic). I still feel that with a better choice of songs Bowie could have eclipsed Queen and U2. The Who performed “My Generation”, “Pinball Wizard”, “Love Reign O’er Me” (another strange song choice given the magnitude of the event) and a blistering “Won’t Get Fooled Again” with much mike swinging by Daltrey and lots of arm twirling by Townshend. Other memories: Elton and Kiki sang “Don’t go Breaking my Heart” (great!). Paul McCartney suffered from sound problems and we couldn’t hear him at all for much of “Let It Be” although I gather it was fine on TV. Geldof drew massive cheers every time he set foot on stage, and he deserved every one of them. The scheduling worked amazingly, with very few hitches. Seeing the cameras pick out Charles and Diana over in their enclosure. The amazingly camp Bowie and Jagger video. The awful, sad and moving video of starving children played to the Cars’ “Drive”. Phil Collins playing Wembley and JFK courtesy of Concorde (show off). But the truly unforgettable moment came at the end, and will stay in my mind for ever. That was the finale, with the entire stadium singing along to “Do They Know It’s Christmas ?” with Bob Geldof leading us, and everyone else on stage. I’ve never seen, felt, or heard anything like it before or since. We walked out of that stadium to the coach park, all of us still singing…..”Feed The World”…..
Then it was a long coach ride back to Middlesbrough. We arrived back around 5 or 6am, then drove home. 24 hours with hardly any sleep, just an hour or so caught on the bus, but a day I will remember forever. Of course, it was never going to be the same. When I heard that Queen were going out on tour again with Paul Rodgers as front man, I could hardly believe it. How was that going to work? What would it be like? However, as an old Queen, Free and Bad Company fan I felt I should go along and support them, and see the new line-up for myself. Marie, David and Laura all came along and we were glad that we did. The way in which the show involved all members with video of Freddie was excellent. And a few Free / Bad Company songs were thrown in for good measure and worked well. You have to give if to them; they managed to pull off what many thought the impossible, to go out with a new front man and make it work. All credit to Paul Rodgers for the way in which he approached this. The show was slick, still relevant and a great tribute to Freddie’s legacy. It will be interesting to see what the new line-up, fronted by Adam Lambert is like. 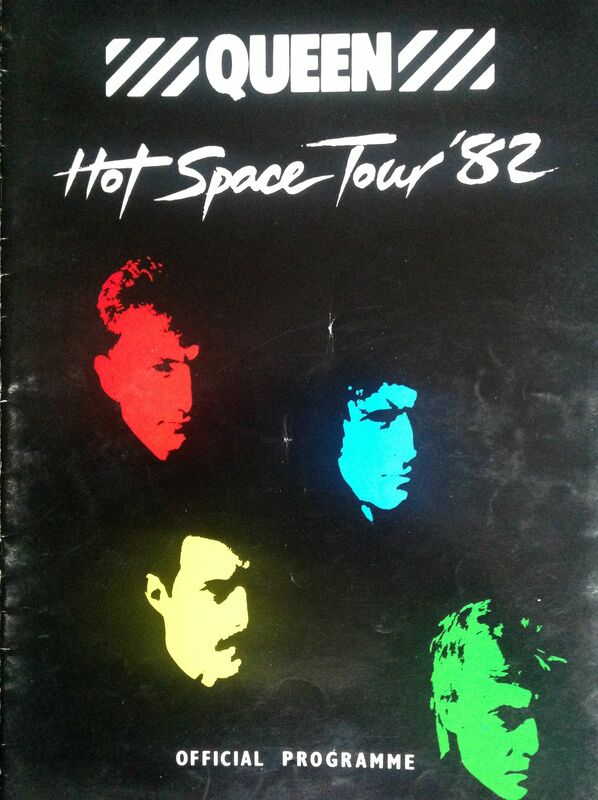 The Magic Tour was the biggest and final tour by Queen. Over a million people saw them, making it one of the largest tours ever. 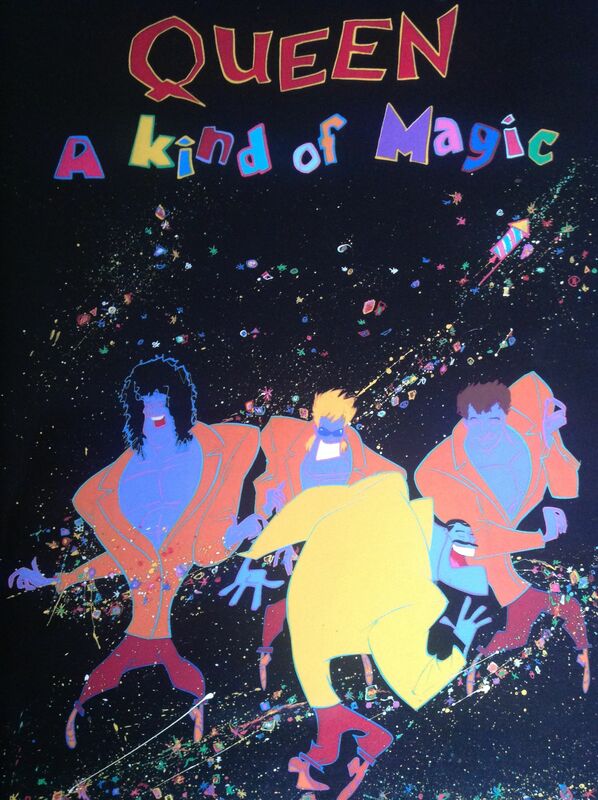 The Magic Tour took in 26 dates around Europe’s stadiums, in support of their latest album A Kind of Magic. The UK leg of the tour played at Wembley Stadium, Manchester Maine Road, and Newcastle St James Park (which I attended). The tour ended with a massive show at Knebworth Park. 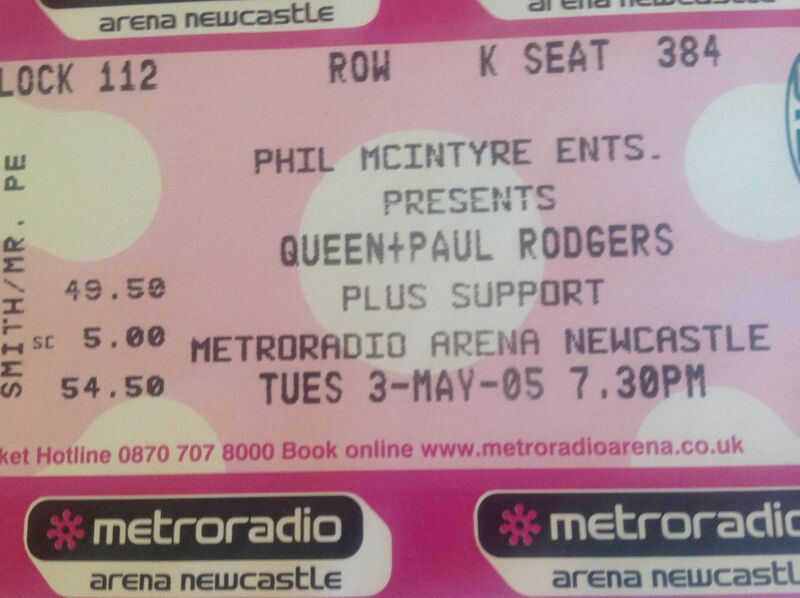 Support acts for the Newcastle gig were Status Quo and Zeno (featuring Zeno Roth, the brother of Uli Roth). Status Quo had just reformed with a new line-up of original front men Francis Rossi and Rick Parfitt, and new members Rhino (bass) and Jeff Rich (drums). It was good to see the mighty Quo back out on the road again, although it must be said that it was only a couple of years since their 1984 farewell “End of the Road” tour. I’m a big fan of Quo and continue to go and see them today. Their set was a classic hits sing (and rock) along. One song I miss is Dirty Water which was a great crowd favourite in the ’80s. Status Quo setlist: Whatever You Want; Paper Plane; Roll Over Lay Down; Little Lady; Mystery Song / Railroad / Most of the Time / Wild Side of Life / Rollin’ Home / Again and Again / Slow Train; Hold You Back; Don’t Drive My Car; Dirty Water; Rockin’ All Over the World; Big Fat Mama; Don’t Waste My Time; Roadhouse Blues. Encore: Caroline; Rain. By 1986 Queen were in the groove of delivering mega stadium concerts, and Freddie had grown into a spectacular front man. The set consists of Queen classics, a few album tracks (some of which were not so good in my view) and great rock n roll covers. The tour was captured on the album Live Magic. Queen setlist: One Vision; Tie Your Mother Down; In the Lap of the Gods… Revisited; Seven Seas of Rhye; Tear It Up; A Kind of Magic; Under Pressure; Another One Bites the Dust; Who Wants to Live Forever; I Want to Break Free; Impromptu; Now I’m Here; Love of My Life; Is This the World We Created…? ; (You’re So Square) Baby I Don’t Care/Hello Mary Lou/Tutti Frutti; Bohemian Rhapsody; Hammer to Fall; Crazy Little Thing Called Love. Encore 1: Radio Ga Ga. Encore 2: We Will Rock You; Friends Will Be Friends; We Are the Champions; God Save the Queen. Queen ceased touring in 1987, due to Freddie’s illness. 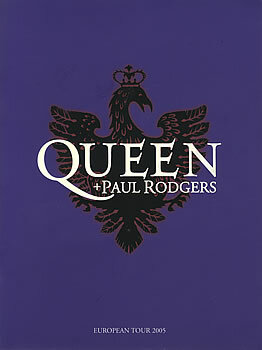 They would not tour again until 19 years later, when the Queen + Paul Rodgers Tour began in 2005, after the tragic death of Freddie Mercury on 24 November 1991, and the retirement of John Deacon in 1997. 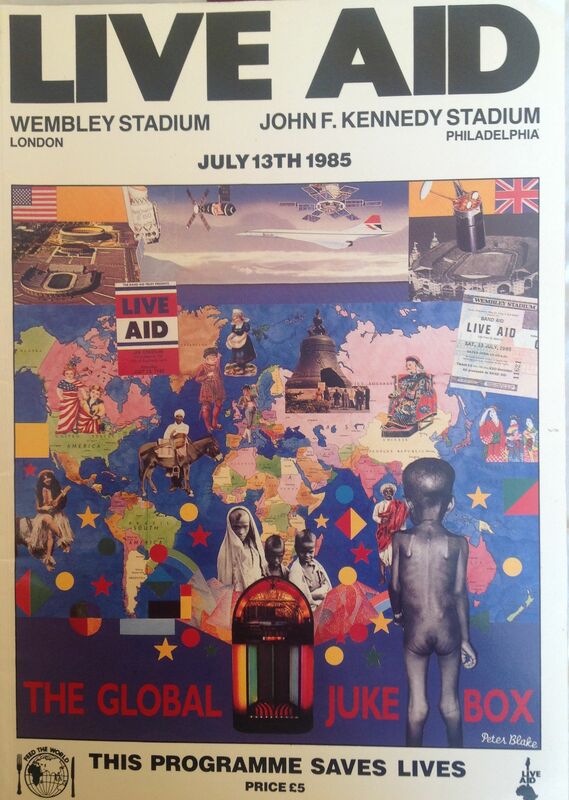 The next time I saw Queen was at the massive historic Live Aid concert in Wembley Stadium on 13th July 1985. Queen’s performance at Live Aid at Wembley is often referred to as their greatest single live performance. Indeed, more than that, their short 21 minute set is often spoken of as one of the greatest rock performances ever (indeed; an industry poll in 2005 named it the greatest rock performance of all time). Their set was sandwiched between some great acts: U2 and Dire Straits preceded them; David Bowie and then The Who had the unenviable task of following Queen’s epic performance. It was one of those performances where everything came together. It was the right time of day, as the momentum and magnitude of the event was building, and the crowd were ready for the stadium-filling anthems of Queen. The band were on fire, clearly ready to give it their all, realising that they were performing to a world-wide audience. And Freddie was in command of us all, leading us through a few of their classic songs. Now I am a massive fan of Bowie and The Who, and for me they were the stars of the day, but I must agree that Queen delivered the strongest performance of the event. 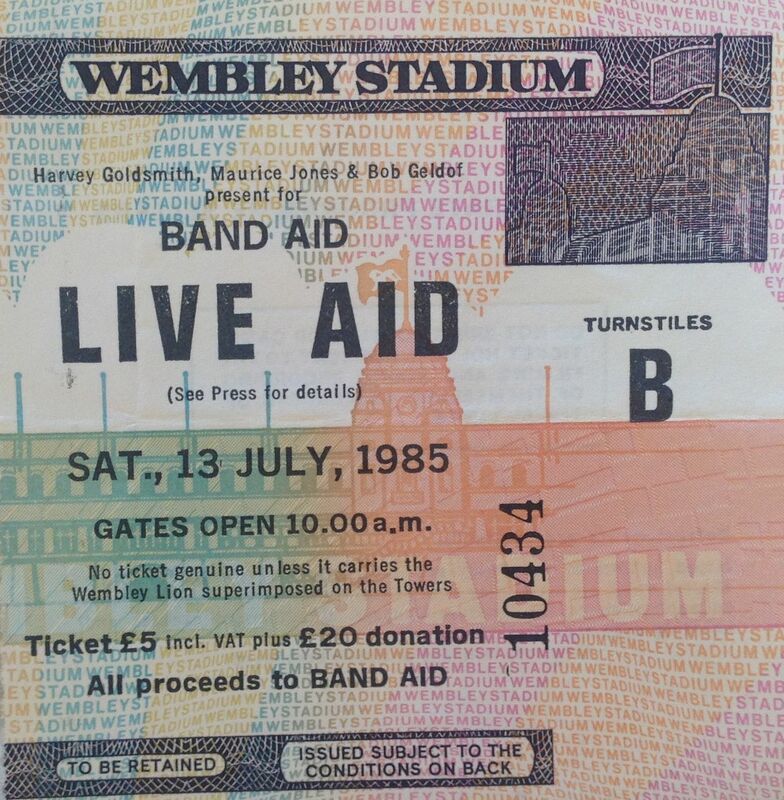 From Wikipedia: “At Live Aid, held at Wembley on 13 July 1985, in front of the biggest-ever TV audience of 1.9 billion, Queen performed some of their greatest hits, during which the sold-out stadium audience of 72,000 people clapped, sang, and swayed in unison. The show’s organisers, Bob Geldof and Midge Ure, other musicians … and various music journalists ….. commented that Queen stole the show. 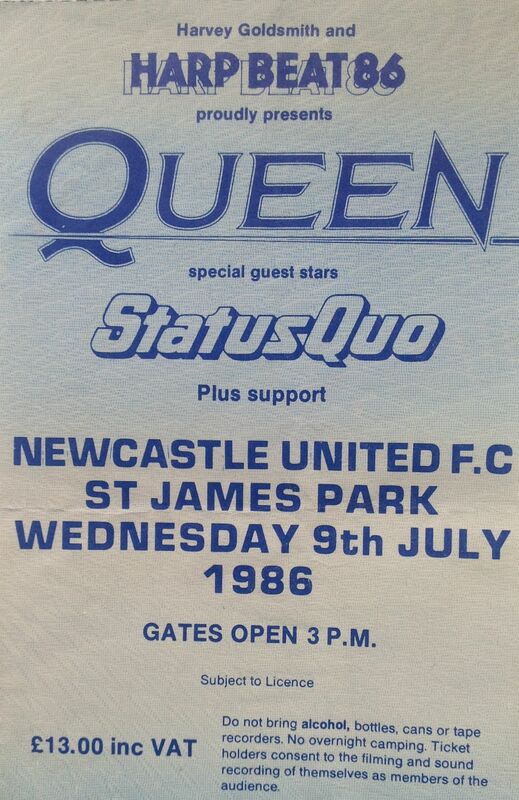 I saw Queen once more, on their 1986 “Kind of Magic” tour, when it called at St James Park, Newcastle. This gig came as a pleasant surprise. I didn’t think that I would ever see Queen back in the City Hall again. 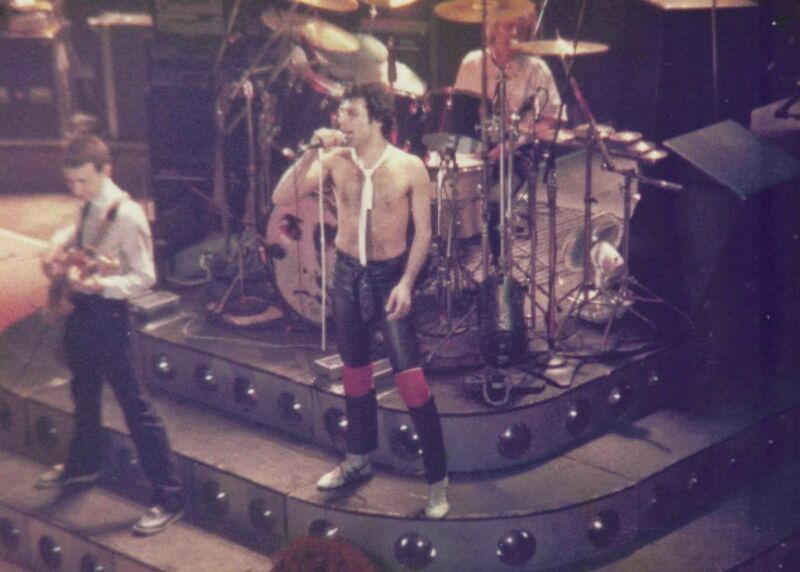 By 1979 Queen were a massive band, and had reached a point in their career where they were becoming much more used to playing arenas and stadiums, than in small provincial concert halls. So I got quite a shock when they announced a UK tour which saw them return to their roots; going back to play some of the smaller venues which they had packed when they were paying their dues in the early days of their career. The tour included two nights at Newcastle City Hall on 3rd and 4th December. Great! I made sure that we got tickets; no more hanging around outside trying to blag my way in, no climbing through a window this time. As soon as we entered the venue is was very clear just how big a band Queen now were, and how much of a “show” we were about to witness. A massive extended stage seemed to take up almost half of the stalls (or the “Area” as the tickets always called it in those days 🙂 …..always seemed a strange name to me), complete with a walkway for Freddie to come out into the crowd. A mass of lights surrounded the stage set-up, and the drum kit stood majestically on a massive raised platform. Pretty impressive and very different from the early days. 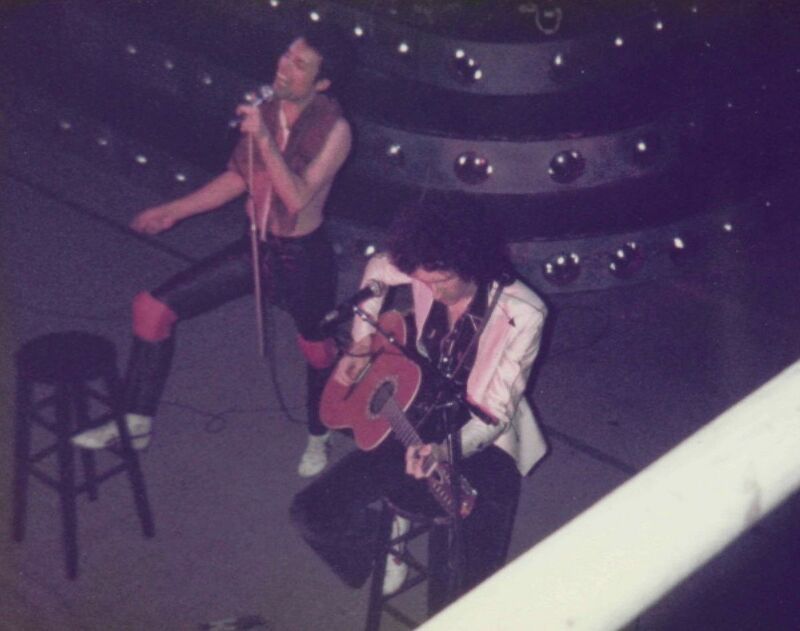 The show itself was ultra-professional, and in parts very staged; at times I felt a little too much so, and my mind reflected back to the early days when Queen were a little more of a rock band. 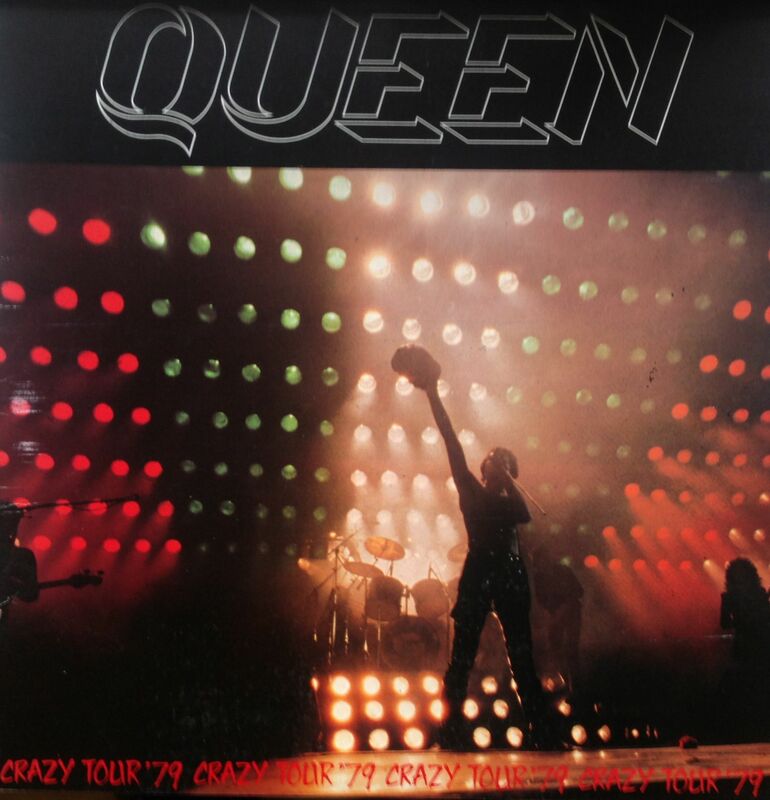 The Queen I saw in 1979, and from then on, was majestic, pomp-rock, a true spectacle. Don’t get me wrong, I continued to admire and follow the band, but I must also admit to missing some of the raw rock’n’roll that the early band were so good at. 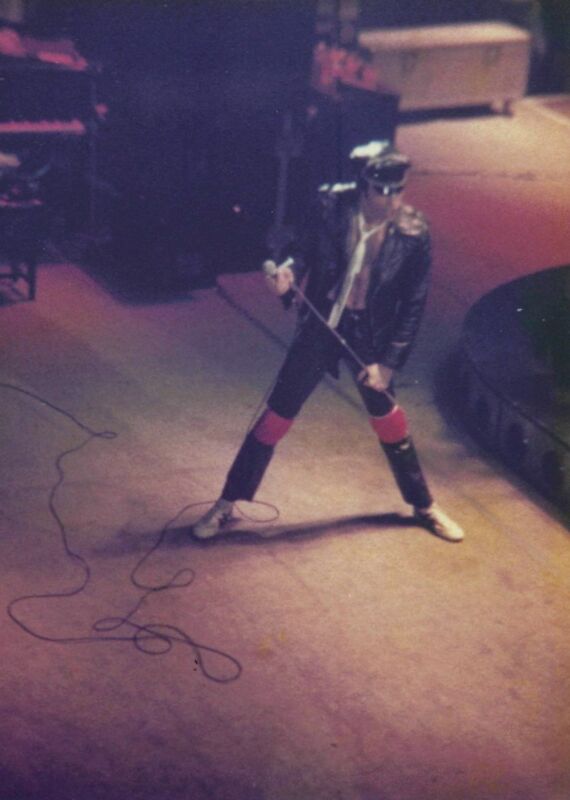 And in each concert, Freddie seemed to grown a little more in confidence, craziness and stature; he began to truly command the audience, and his vocal strength also seemed to grow alongside his presence. This would, of course, reach its peak in Wembley Stadium, at Live Aid in 1985, where Freddie and the band stepped up into yet another league. But that’s for a blog in a few days time. The City Hall show that night saw Queen take us through all their classics in what was quite a long set. Very impressive. It was almost as it they were marking their territory as one of the UK’s, and the world’s, major bands; and they probably were. We left the hall that night, feeling privileged to have see something truly legendary, unique and spectacular. Setlist: Let Me Entertain You; Tie Your Mother Down; Somebody to Love; If You Can’t Beat Them; Mustapha; Death on Two Legs; Killer Queen; I’m in Love with My Car; Get Down, Make Love; You’re My Best Friend; Save Me; Now I’m Here; Don’t Stop Me Now; Spread Your Wings; Love of My Life; ’39; Fat Bottomed Girls; Keep Yourself Alive; Brighton Rock; Bohemian Rhapsody. 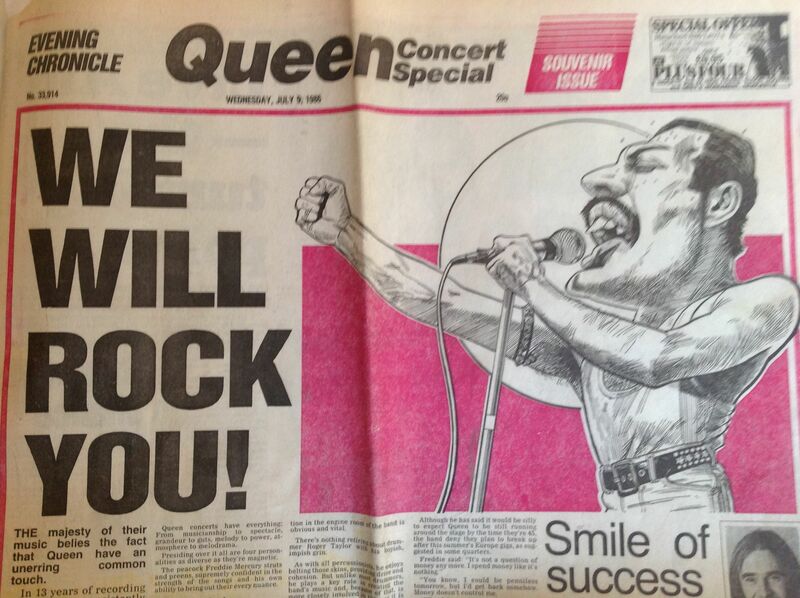 Encore: Sheer Heart Attack; Crazy Little Thing Called Love; We Will Rock You; We Are the Champions; God Save the Queen. This was the last time I was to see Queen in such an intimate setting. From that night onward, I would watch them from the pitch or stands of a football stadium. 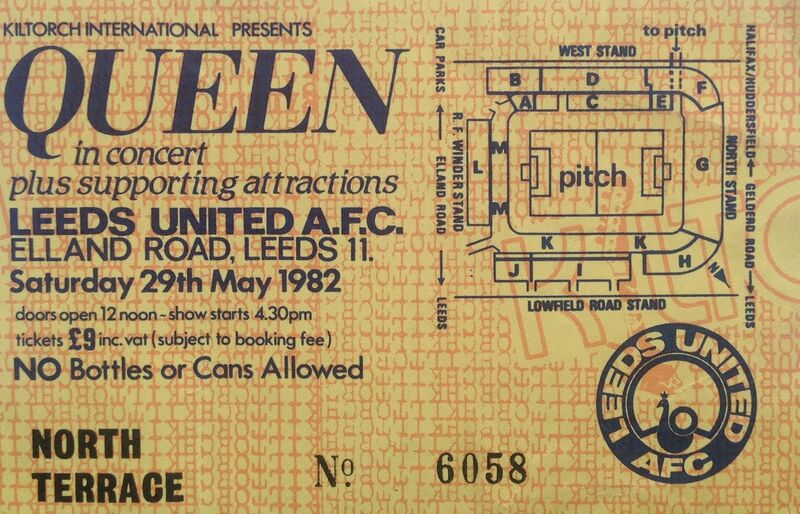 It was inevitable that their career would progress that way; their anthems and Freddie’s stage presence were made for the rousing singalongs of the terraces. I’ll write about those experiences over the next few days. 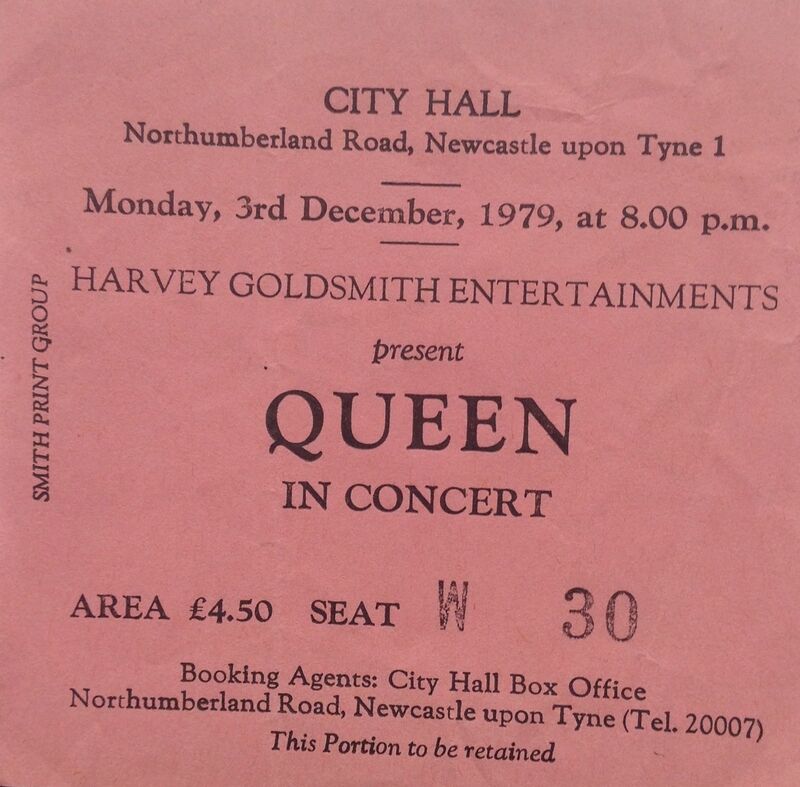 Many thanks again to Mitch for allowing me to use his excellent pictures of Queen, which he took at Newcastle City Hall on 4th December 1979, the second of the two nights which they played there as part of the “Crazy tour”. Support from Kiki Dee, Steve Hillage, and Supercharge. The last open air festival event I went to in the long hot summer of 1976 was Queen in Hyde Park. A group of us went down to London by train on a day return ticket, returning straight after the concert on the mail train which pulled out of Kings Cross at midnight. This was a free concert, which drew a crowd of over 150,000, and was organised by Richard Branson. The line-up consisted of Supercharge, Steve Hillage and Kiki Dee. Kiki Dee had just been No 1 in the charts with Elton John and their massive hit Don’t Go Breaking My Heart. There were lots of rumours about that Elton would join her onstage for the song, but he didn’t; instead she was accompanied by a life-size cardboard Elton figure, and we all had to sing the Elton parts with her. Steve Hillage was quite popular at the time, and was great on the day, lots of glissando guitar, and amazing psychedelic trippy versions of the Beatles’ All Too Much, and Donovan’s Hurdy Gurdy Man. There was a big fight in the crowd during his set. 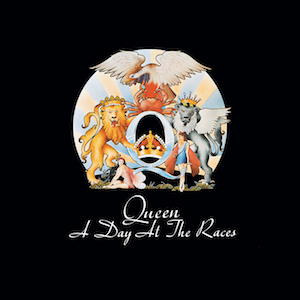 But the day belonged to Queen. It was quite a brave move headlining such a major event at what was still a relatively early point in their career, but they pulled it off and were as majestic as ever. Their set was relatively short, around an hour, because of curfew and time restrictions. Apparently Queen were prevented from returning for their usual long encore by the Police. This was just before they released the Day At The Races album. Freddy was amazing, although from where we were standing he was a tiny white figure shining across the massive sea of people (no big screens to watch in those days).